This is one of my favourite foods to grab on the move at markets – stuffed Turkish flat breads, served hot off the grill with some freshly sliced lemon. There’s a great little food cart at Preston Market that fires these out by the dozen, and I also really like the ones at the Kingsbury Drive Community Market at La Trobe University in Bundoora. I’d always been a little curious about trying to make them myself, but always thought the dough would be too complicated… But a while ago I was flicking through some cook books and found a recipe in my Lonely Planet Street Food cook book (amazing book, by the way! ); turns out the dough isn’t so complicated, the recipe is actually really simple, and unbelievable delicious! 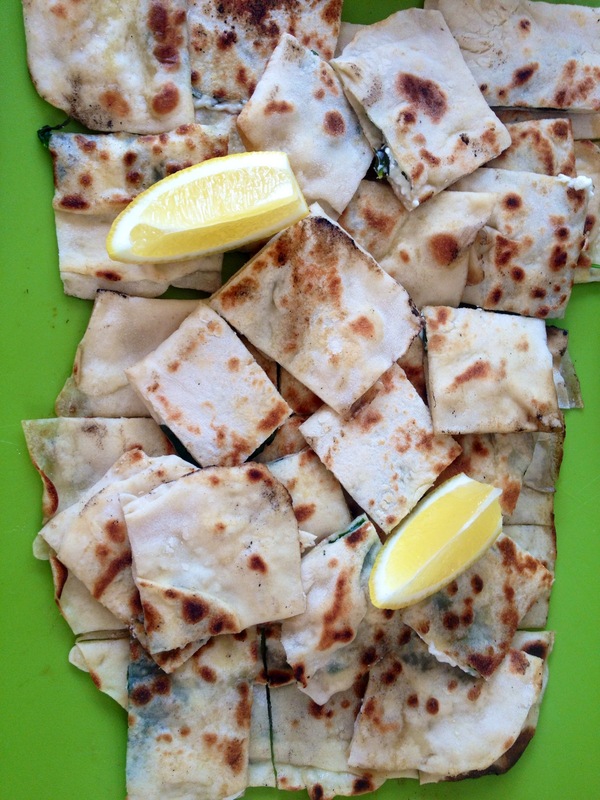 This recipe makes about 8 decent sized gozleme – I usually halve the recipe if I’m making a few to put on the BBQ when we have a few people over for a catch up! I’ve made this quite a few times now, so here’s my version, adapted from the Lonely Planet recipe. 1. Sift the flour into a large bowl (reserve ¼ cup), add the salt and create a well in the centre. 2. In a small bowl, stir together the yeast, sugar and ¼ cup water, then pour it into the well in the bowl of flour, and sift the remaining quarter cup over the liquid. Sit it aside for 10 minutes. 3. Add the rest of the water to the bowl and stir together well to combine. Knead the dough on a floured board for around 5 minutes, then put it back into the bowl, cover with a clean tea towel, and set aside for an hour to rise. 4. In another bowl, combine the spinach and fetta, and set aside. 5. After rising, take the tough out of the bowl and divide into 8 equal portions. Shape each portion into a rough ball and roll out of on a floured board into a rectangular shape – you’re aiming to have it thin enough that you can just about see through it if you hold it up to sunlight, but not so thin that it easily tears. 6. Sprinkle some of the spinach and fetta mixture onto one half of the rectangular piece of dough, fold the uncovered half over and press the edges together to seal. 7. To cook the gozleme, heat a large, non-stick fry pan over high heat, or fire up the BBQ as I prefer to do. Spray a little cooking oil and cook for a few minutes on each side, until the dough becomes speckled with brown spots. 8. Slice up your gozleme with a pizza cutter or sharp knife and serve hot with lemon wedges, and chilli flakes if you’re spicily inclined.